2015-16 Norris Trophy Winner: Tyson Barrie? The James Norris Trophy, awarded annually to the NHL’s best defenseman, has been secured by a number of the League’s greatest players. Elite talents such as Bobby Orr, Nicklas Lidstrom, Ray Bourque and Chris Chelios are simply a few players who have captured the prestigious award. More recently, highly skilled young defenders, namely P.K Subban, Duncan Keith and Erik Karlsson have captured the Trophy. In 2015-16, Tyson Barrie will look to continue this trend, as the young blue-liner from Colorado appears poised to enjoy his most successful NHL season to date, one which, based on his continually progressing play, could see him skate into Norris Trophy consideration. Ever since his junior days with the Kelowna Rockets of the Western Hockey League, Barrie has been a tremendous offensive force and quality defender. Barrie spent four seasons with the Rockets where his game improved on a yearly basis. In his first season, Barrie collected 43 points over 64 games, a total which rose to 52 points in his second season. As a result, Barrie was selected, if not stolen, in the third round, 64th overall in the 2009 Entry Draft by the Colorado Avalanche. Following his draft selection, Barrie was downright unstoppable on the blue-line during his third season in Kelowna, recording 19 goals and 72 points, totals which ensured his reception of the Bill Hunter Memorial Trophy as the WHL’s defenseman of the year. In his fourth and final season with the Rockets, Barrie once again produced at a point per game pace, recording 58 points in 54 games, while he also represented Canada on the international stage, securing a silver medal at the 2011 World Junior Hockey Championship. In 2011-12, Barrie got his first taste of professional hockey with the Avalanche’s AHL affiliate, the Lake Erie Monsters. Impressively, Barrie led his the Monsters in scoring at the mid-way point of the season, and certainly would have led the team for the year given he had scored 32 points in 49 games. 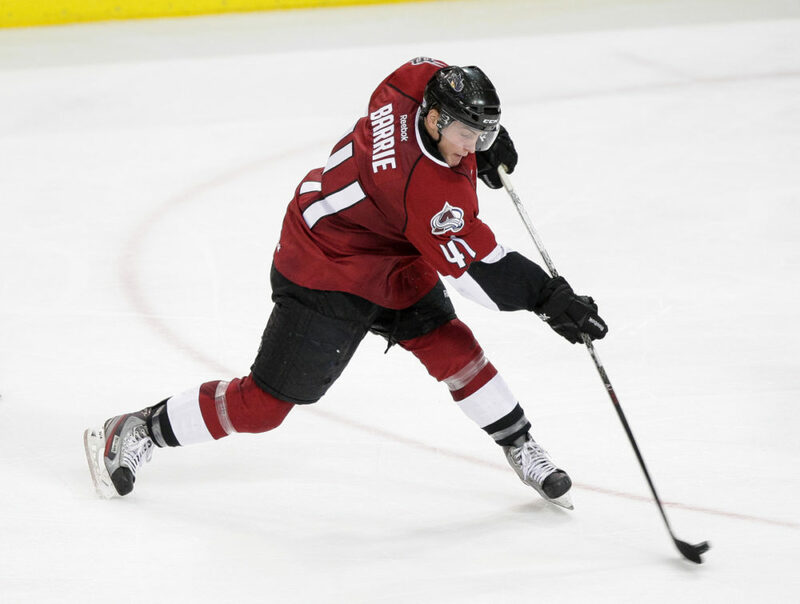 However, following an AHL all-star nomination, Barrie was re-called by the Avalanche. In his first taste of NHL hockey, Barrie appeared in ten games, yet failed to register a point. However, his brief time spent with Colorado undoubtedly allowed Barrie to understand the requirements of a full-time NHL player. The following season, 2012-13, Barrie once again dominated the AHL, resulting in another NHL call-up. 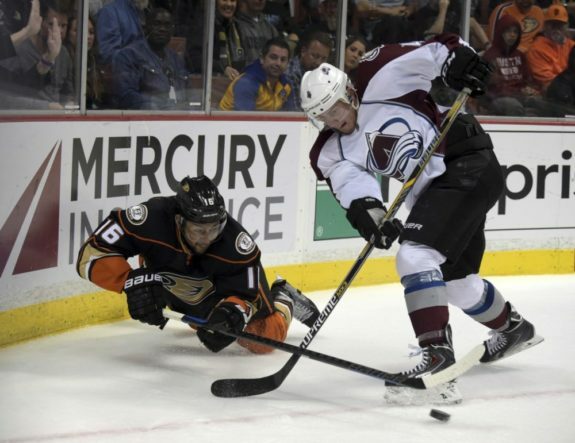 In 32 games with the Avalanche, Barrie scored his first two goals and added 11 assists for 13 points, illustrating his raw offensive abilities. Come 2013-14, Barrie’s play was so strong that he played nearly a full NHL season, appearing in 64 games, scoring 13 goals alongside 38 points. One of Colorado’s strongest, yet youngest defenders, Barrie continued his dominant play into the playoffs, where a knee on knee hit from Minnesota Wild agitator Matt Cooke tore Barrie’s MCL, subsequently forcing him to miss the remainder of the season. Although he has only one full NHL season under his belt, Barrie’s elite skills and determination will make him a Norris Trophy threat in the near future, quite possibly this coming season. After scoring 12 goals and 53 points over 80 games in 2014-15, it is quite clear to see Barrie has tremendous potential. This coming season, not only will Barrie’s game continue to progress, but he will be fortunate to play alongside yet another tremendously talented defenseman in Erik Johnson, who missed half of this past season with a knee injury. The tandem of Johnson and Barrie will undoubtedly be Colorado’s top defensive pair this coming season, and once again will be slated with the teams toughest assignments. In 2014-15, Barrie not only matched up against the top lines of opposing teams, but in doing so averaged over 21 minutes of ice time per game. Despite logging huge minutes against elite players, Barrie recorded the lowest SA60 (Shots Against per 60 minutes of ice time) of all Avalanche defenders at 30.03, indicating that he is not only a quality offensive player, but also a key player defensively as well. Needless to say, if Barrie’s game continues to progress at its current rate alongside steady defensive improvement, we could be looking at one of the NHL’s top young defensemen. Sure, he has had incredible success in his career thus far, however, it appears as though the sky is the limit for Barrie, who could quite possibly secure a Norris Trophy in the immediate future.